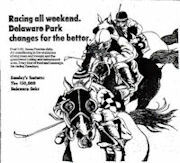 Delaware Park rated a purse structure of 6 back in the eighties, which not a bad number had the track on the brink of destruction. Once again it's the happy Racino ending, well maybe not. Delaware benefited from being an early entrant into Racino style gambling but since then their popping up like weeds and the fields at Delaware are reflecting that. Today Delaware Park has a purse value index of 41. Delaware Park racino or not deserves to stay in existence. It is part of racing history and has charm that can only be found in places like Saratoga or Keenland. All you have to do is pay a visit to the outdoor paddock where the horses are saddled under the trees to know it is a special place. In 2011 Delaware Park ran it's normal May to November schedule supplemented with a full casino operation. Joe Rocco Jr. came away with the riding title. If you look at the track layout you will see the original configuration for Delaware Park, which included a steeplechase course. On the photo page you can still make out the outline of that course.